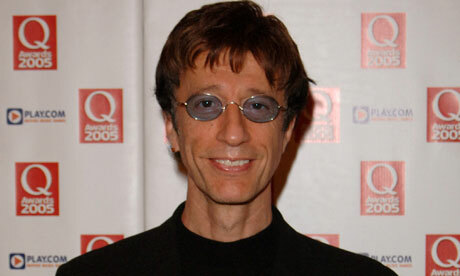 A hundred years since the ship went down, the 1,500 victims of the Titanic disaster will receive an unlikely memorial – the first self-described classical work by Robin Gibb of the Bee Gees. 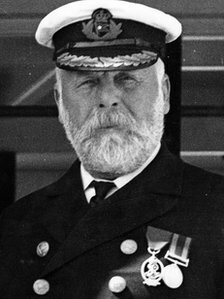 Composed with his son RJ, Titanic Requiem will be performed in London on 10 April by the Royal Philharmonic Orchestra – the anniversary of the doomed ship's departure from Southampton. The event will boast a hologram show depicting the sea, the ship, and – naturally – the iceberg. The cost? $4,900 to $14,850 per person, for the April 10-18 voyage from New York and back again. On the 15th at the site of the Titanic's sinking, the ships plan to hold "a memorial service at 2:20 a.m. to commemorate the 100th year anniversary and to pay tribute to all the brave passengers and crew on board that fateful night." At 11.40pm on the 14th April 1912 RMS Titanic struck an iceberg in the North Atlantic, near Newfoundland. Of the 1523 people who lost their lives 549 came from Southampton. 100 years after the tragic sinking of the White Star liner RMS Titanic, the city recognises our unique link to the tragedy. The disaster struck at the heart of Southampton as hundreds of city residents went down with the fated vessel. Events across the city give you the chance to connect with the voices of the past that echo through history, telling the story of that disastrous night. All residents of Hampshire, Isle of Wight, Wiltshire and Dorset are invited to submit their artwork for this 'open exhibition.' This year the theme is the Titanic. In April 2012, it will be one hundred years since the famous White Star Line ship set off on its ill-fated voyage to America. The iceberg that intervened, the tales of heroism and the deep sea excavations of the ship embedded in the Atlantic have become legendary. We encourage artists of all ages working in a range of media to rise to the challenge of creating a new piece of work based on this theme. The judges invite entrants to consider the brief as creatively as possible and will consider both 2-D and 3-D work in any medium (although video and multi-media work cannot, unfortunately, be accepted due to technical limitations). The successful entrants to the exhibition will have their work exhibited at Southampton City Art Gallery from 17th March – 29th April 2012. Southampton’s search for this year’s best family book sets sail with the launch of Southampton’s Favourite Book to Share Award which is 'Sea' or 'Maritime' themed for 2012. The competition, which is run by Southampton City Libraries, is designed to encourage parents and carers to enjoy a good story with children under the age of five. Copies of each of the colourful tales will be available from April 1st at all of the city’s libraries, from Sea City or Tudor House Museum, along with voting slips. Staff from Library Services will also be visiting parent and toddler groups across the city to help them to check out the competition. Pupils from various Southampton schools will be performing including The Southampton Youth Concert Sinfonia, First Steps, Stick It Percussion Ensemble, Ready Steady Sing and Southampton Young Singers. A version of this concert will also be played in the Cherbourg Theatre on 14th April 2012. Free drop in session. 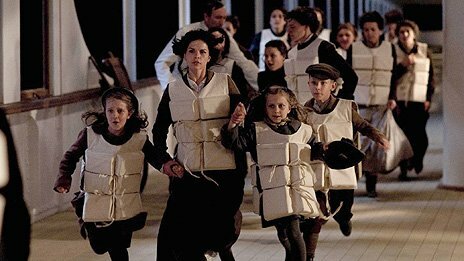 An exciting array of activities will be on offer for all the family to commemorate the Titanic Centenary. Activities include rhymes, songs & shanties with storyteller Fiona Moore; green screen acting & filming opportunities with filmmakers from ‘Butterfly FX’; launch of the “Favourite Book to Share” competition for Under 5s in partnership with Southampton libraries; Titanic 2012 creative writing competition station; art and craft activities with artists Holly Deacon, and even have your own maritime-inspired face painted! The Titanic was just one of hundreds of thousands of British merchant ships that have been lost in peace and war. Was your ancestor on board one? A crew member, a passenger, maybe even the captain? Have you been trying to trace a ship that disappeared? Come and join in this event to help you find out more using websites, Southampton Library’s collection, and the resources of the National Archives. Bring along details of any ancestors or ships you’re trying to find. Dr Simon Wills is a maritime genealogist who has been researching and writing about maritime ancestors for over twenty years. He has a special interest in the merchant navy 1750 to 1950. He lives in Southampton and has just completed his book ‘Tracing Your Merchant Navy Ancestors. Free but places are limited and must be booked in advance. Southampton Old Cemetery opened in 1846 and was one of the first Municipal owned Cemetery's in England. It covers 27 acres and holds over 1,680 burials. The Cemetery holds 45 Memorials for Titanic victims. The Friends of Southampton Old Cemetery are a group of volunteers who are interested in the history and maintenance of the Grade II listed Cemetery. The volunteers will lead walks around these memorials and relate the hardship the families suffered through the disaster. Walks last approximately 1.5 hours. On all walks there will be Titanic memorabilia and books for sale and refreshments will be available. Southampton Tourist Guides Association is the only official tour guiding organisation in Southampton. As a consortium of fully qualified tourist guides we be dedicated to serving residents and visitors to the city and its surrounds in their quest to finding out what there is to know about this part of England's origins, history and culture. Step back in time to 1912 as the Oxford Street remembers Titanic. Visit the street to enjoy: Special menus, a Titanic Trail, meet costumed characters and browse a special maritime themed market of local artists and creatives. Titanic – From Prow to Stern is a full-scale outline of the Titanic including the exact length and beam, together with an indication of the positions of the main features, lifeboats and funnels. You will be able to grasp the scale and indeed walk its entire length. The installation will also include voice recordings from the archive of the City’s Oral History Unit, and the names of all those from Southampton who perished, with simple commemorative flowers. During the night of the centenary there will be a spoken timeline of events and Distress Flares launched. The intention is not to dramatise the incident, only to provide an accurate and evocative space for reflection and remembering. Tickets:Tickets (unreserved) are available direct from the orchestra and are priced £14 (full), £12 (over-60s), £10 (students & unemployed) and £7 (under-16s). Contact: Please visit the orchestra website at the bottom of the page for tickets and further information or email publicity@csorchestra.org or telephone 023 8077 9340. The City of Southampton Orchestra is presenting a joint event with ABP and Brazier Interiors. A special concert from the Queen Elizabeth Terminal, overlooking the berth from which the Titanic set sail. The orchestra will be joined in Vaughan Williams’ magnificent ‘Sea Symphony’, by soloists Jane Streeton (soprano) and Mark Oldfield (baritone) as well as a specially formed ‘Titanic Chorus’ made up of members of the Southampton Philharmonic Society, Taunton’s Community Choir, Romsey Choral Society and Basingstoke Philharmonic. The symphony uses texts about the sea by Walt Whitman and will be a fitting tribute to the Titanic and the spirit of adventure of those sailing on her. The evening will commence with an ‘embarkation experience’ exhibition with drinks reception and palm court music from the White Star song book. The orchestra will be working with Greyladyes Arts Foundation in presenting an exhibition reflecting the dockside experience of 1912 and members of the Sarah Siddons Theatre Group, which specialises in reconstructing Southampton history, will be enacting characters of the time. The Titanic story has particular resonance for street theatre company The Sarah Siddons Fan Club as two members have relatives who were crew on the ship. In researching for their latest production Titanic, the Southampton Story they were able to call on first hand accounts from family members as well as witness accounts from the enquiries and the records of the Titanic Fund. The theatre company specialise in site specific productions about real historical incidents and Titanic, the Southampton Story is no exception, using real buildings from the period as backdrops the performance will focus on the experiences of the crew and their families from the excitement of the maiden voyage through to the aftermath of the tragedy. Starting at Holy Rood, onto the houses in College Street, over to Oxford Street and then performing scenes outside Seaman’s Mission, The Grapes, SW House, over to Queens Park and finishing in St Joseph's Church. Look Out! is performed by White Star Line-Up – a group of primarily Southampton-based singers and musicians formed specifically to tell this story. Featuring song, music and spoken word, it relates the events leading up to the tragedy, and the aftermath, from the viewpoint of the town and its Southampton crew. Admission: FREE Activity but must be pre-booked through SCC Arts & Heritage. 15 spaces per session; £5 refundable deposit required. Hear the story of Tiddler by Julia Donaldson and then create your own colourful fishy sculpture with artist Debra Marsh. In Partnership with Southampton City Libraries to celebrate this year’s ‘Book to Share Award’. Activities are funded by Southampton Wider Family Learning are limited to two children per adult. All children must be accompanied by an adult. In partnership with Solent University and Waterstones. Christopher Ward is the grandson of Jock Hume, at 21 the youngest member of the Titanic's orchestra. Gill Paul is the author of more than 30 books, including biographies and novels. Waterstones will be selling copies of the books on the evening. Admission: FREE but must be pre-booked through SCC Arts & Heritage. 15 spaces per session, £5 refundable deposit required. Contact: Please call 023 8083 4536 to book. Get your imagination flowing with a maritime story and then work with artist Holly Deacon to create amazing pictures of what you might sea through a porthole if you were sailing in the ocean. In partnership with Southampton Libraries to celebrate this year’s ‘Book to Share Award’. Activities are funded by Southampton Wider Family Learning are limited to two children per adult. All children must be accompanied by an adult. Contact: Tickets will be available from 1st February and can be purchased from the Southampton Visitor Information Centre, Lower Ground Floor, Central Library, SO14 7LW. Maria Newbery, Curator of Maritime & Local Collections / Vicky Green, Crew Specialist and Jo Smith Archivist will be on hand to tell you more about some of the rich resources held within the city’s museums, libraries and archives. A Night To Remember is a 1958 docudrama film adaptation of Walter Lord's book of the same name, recounting the final night of the RMS Titanic. Southampton Solent University During April you will be able to visit an exciting new exhibition by members of Red Hot Press print workshop. To commemorate the Titanic's centenary workshop members have produced a boxed set of 17 original prints on the theme of the Titanic. A limited edition of 9 box sets of prints will be for sale and the complete set will be exhibited in the Concourse Gallery of Southampton Solent University throughout April 2012. Come and celebrate Sea City’s opening weekend with all the family! Enjoy these FREE exciting array of activities to celebrate Southampton’s rich maritime history. Be arty, talk to costume interpreters, try your hand at a Victorian game and enjoy all that Sea City Museum has to offer. Entrance charges apply. This annual commemorative service will be lead by Reverend Dr Julian Davies. The service will include readings, music from the Salvation Army Band and the City of Southampton Orchestra and singing by local choirs. The Mayor of Southampton Councillor Terry Matthews will be in attendance. Coinciding with the centenary of the departure of the Titanic on her fateful voyage from Southampton and her sinking on 15 April 1912, this cultural day will explore the rich cultural history of the retelling of the ship’s story in literary and cinematic form, and across many different cultural contexts. Filmic representations range from a silent German movie made only weeks after the disaster to James Cameron’s epic from 1997, with a number of British, American, and European productions in between. The Cultural day will also explore a number of wider issues relating to the connections between maritime history and the cinema. Places are limited, so book your place early to avoid disappointment. Work has started on transforming the Grade II Old Magistrates’ Court building into the Sea City visitor attraction, which is due to open in April 2012 in time to commemorate the 100th anniversary of the disaster. The first temporary exhibition for 2012 will be ‘Titanic – the Legend’ and will focus on the international fascination with the story of the Titanic. A single flare was fired above the city's docklands to signify the exact moment - 12.13pm - 100 years ago when the ill-fated liner rolled down the slipway and touched the water for the first time. All boats in the area around the Harland and Wolff shipyards, where the pride of the White Star fleet was built, then sounded their horns. In 1911, thousands of cheering well-wishers gathered at the same place to celebrate the historic moment. A century on, the mood was again one of celebration at the event on the Queen's Island slipway which focused more on the ship's construction than its fate. After the flare was fired, crowds clapped for exactly 62 seconds - the length of time it took for the liner to roll down the slipway in 1911. 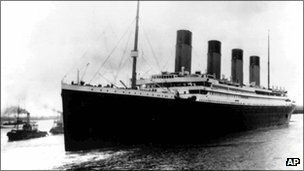 The Titanic sank on her maiden transatlantic voyage 11 months after her launch, with the loss of more than 1,500 lives, when she struck an iceberg. Among the invited guests at the commemoration were schoolchildren and representatives from the four other cities and towns directly connected to the Titanic story - Cherbourg in France, Cobh (formerly Queenstown) in Co Cork, Liverpool and Southampton. The Harlandic and Queen's Victoria male voice choirs sang a number of hymns during the half-hour service close to the almost-complete £100 million Titanic visitors centre, which is set to open ahead of next year's centenary of the liner's sinking in 1912. 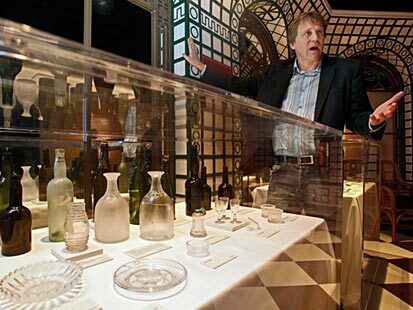 Earlier, a major new exhibition on the Titanic opened at the nearby Ulster Folk and Transport Museum, boasting some artefacts recovered from the liner that have never been put on public display before. Descendants of many of the men who helped build the ship, some of whom sailed on the first voyage and died in the maritime disaster, attended the service. Lord Mayor of Belfast, councillor Niall O Donnghaile, said Belfast's role in the Titanic story had been overlooked in the past. "The Titanic story is probably one of the most fascinating, amazing, poignant, thought-provoking and absorbing tales from the last century, if not the last millennium," he said. "For too long, Belfast's part in the Titanic story, and the role of the people of Belfast in bringing Titanic to life, has been neglected. "Over the past few years, the city that gave birth to the ship, and many others, has finally and rightfully acknowledged her part in the tale, and today we are proud to celebrate the achievement, epitomised by this historic moment, and educate the world about our city's role in the Titanic story."